How beautiful is the nail polish?! I'm a bit glitter obsessed, so had to have this, and I really do think it's one of the nicest glitter polishes I have ever tried. 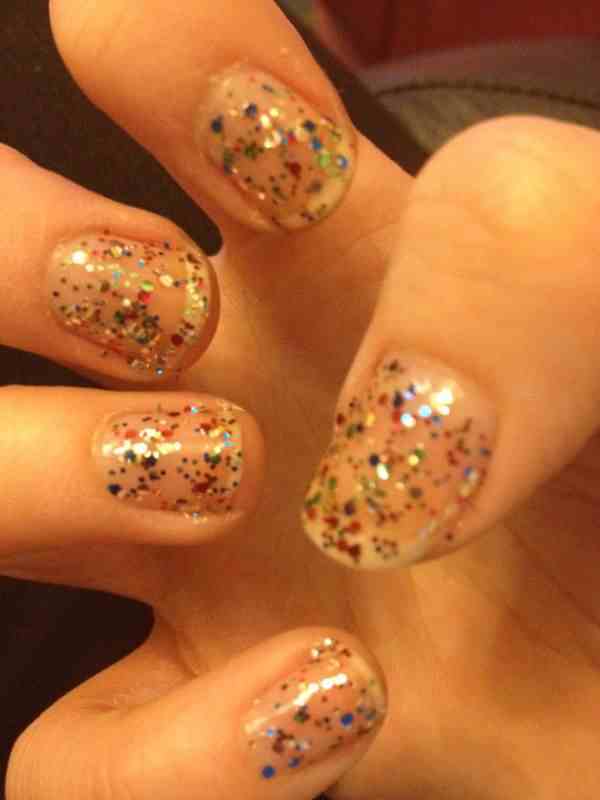 I think it's that the majority of the glitter particles are really big, which makes it look so effective on the nails. The first picture shows my nails painted with three coats of polish, and the second picture shows my nails with only one coat, which I still think is pretty impressive. I think it will look brilliant ontop of other colours as well as on it's own. When I look at the polish on my nails it reminds me of a children's birthday party! It's packed with colour and sparkles in blue, gold, river, green and red. You can see how similar this is to OPI's Rainbow Connection polish (shown bottom right), which I'm not lucky enough to have... but now, I don't need it! £5 for something that actually cost 99p new? Love the glitter and it does look like OPI! Whoohoo a good find!